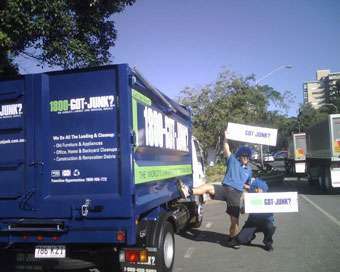 Brisbane Rubbish Removal & Green Waste Disposal | 1800-GOT-JUNK? 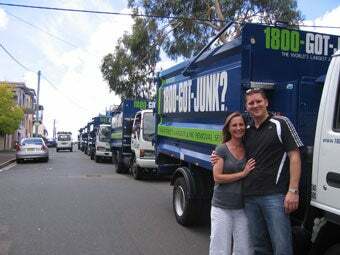 Brisbane's Favourite Rubbish Removal Provider! 1800-GOT-JUNK? provides professional rubbish removal for Brisbane properties, with courteous, reliable same-day service for homes and businesses. We’ll take anything off your hands, whether it’s a small assortment of items or truckloads of garbage, and dispose of it all in an environmentally friendly, socially conscious manner. For rubbish removal in Brisbane, you can count on us for fast, efficient and responsible work. 1800-GOT-JUNK? gives you a quick and simple process for booking rubbish removal in Brisbane. When you call us to set up a time, we’ll give you a two-hour arrival window, and will contact you 15 – 30 minutes before the window to let you know when our team will arrive. Once they get there, you point at the things you want taken and they’ll give you an upfront, all-inclusive price before getting to work. Bringing full-service rubbish removal to Brisbane means that everything, up to and including any necessary clean-up, is handled by our team. We Haul Almost Anything Two People Can Carry! When you choose 1800-GOT-JUNK? for rubbish removal in Brisbane, you’re guaranteed to have all of your unwanted clutter removed the second our truck is gone! We take any non-hazardous items, including old or broken furniture, household appliances, hard & bulk rubbish, electronics, green waste, office supplies, tyres, scrap metals and whatever else you have lying around and no longer need. We pride ourselves on taking a responsible approach to rubbish removal in Brisbane and will always work to ensure that any items we can recycle are taken to the appropriate facility. We also work with various local charities in the area and donate as much as possible. See why 1800-GOT-JUNK? is your number one choice for rubbish removal in Brisbane! Call us at 1800 468 586 or book online to save up to $10! Have you recently updated your space with new furniture and décor? Maybe you've decided that it's time to part with the items that are taking up space in a storage unit, costing you hundreds of dollars a year in maintenance and storage fees. Remodeling your home or simplifying your life is an enjoyable process, but what do you do with the old furnishings? If you're ready to get rid of old furniture or other unwanted items, give 1-800-GOT-JUNK? a call today. Our experts specialize in helping households just like yours dispose of their unwanted items and reclaim their space. From large items such as sofas and appliances to clutter that has accumulated over time, no job is too big or too small for our team. Give us a call today and show us what we're up against! Our junk removal experts are friendly, courteous and always ready to take on a good challenge. We even offer same-day pickup, making furniture removal in Brisbane easier than ever. If your basement, spare bedroom or attic has more clutter than you know what to do with, then give us a call. You don't even have to gather it all into one place; just point and junk disappears! We'll gather your unwanted items, sort them and load them onto our truck, and we'll even sweep up after we're done. 1-800-GOT-JUNK? is the world's largest junk removal service, and we've been in the business of helping people since our founding in 1981. We have become the community's favorite Brisbane junk removal service by providing efficient service, clean, spacious trucks and an outstanding team of uniformed employees. We offer simple and straightforward pricing; you pay for the space your unwanted items take up on our truck, and you never have to worry about hidden fees or surprise charges. Not only do we serve Brisbane households, but we also serve the businesses of Brisbane as well. If you are a business owner that has recently remodeled your office or place of business, give us a call. We can dispose of your unwanted items, including old office furniture, computers, printers and more. Just point and junk disappears! Have you been putting off getting rid of the junk and taking control of your space because you hate to contribute more to local landfills? At 1-800-GOT-JUNK?, we take our responsibility to our community seriously. For us, recycling isn't a novelty; it's been a standard practice since we began. In fact, we recycled before it was cool! Once we take your items, we donate what we can to those in need. Items that are not in usable condition or cannot be donated will be taken to a local recycling facility. We only take junk to a landfill as a last resort. Your Local Green Waste Removal Specialists! Do you have piles of junk sitting around your Brisbane home or office? Do your friends and family members joke around that you might be a hoarder? Are you just sick and tired of your old furniture and ready for a change? If you answered yes to any of these questions, you are in need of Brisbane green waste removal from 1-800-GOT-JUNK?. We are experienced junk removers and haulers, and we can get rid of that unsightly mess for you in no time so that you can say, "Goodbye junk. Hello relief". Over the years, we have assisted over 20,000 clients, helping them to achieve their dreams of a clutter-free home or work space. We're in your neighbourhood, so we can send someone out to your location right away. We don't want you to have to suffer with excess junk for any longer than is absolutely necessary. Rather than hiring a skip so that you can unload your junk, just let us do it for you. When you use a skip hire, you'll have to do all of the heavy lifting and dirty work yourself. In addition, you'll also have the added pressure to get everything done as quickly as possible so that you don't have a skip sitting in front of your home or office for extended periods of time. No one wants to look at that! When you work with 1-800-GOT-JUNK?, we'll turn up with a freshly cleaned moving truck to haul away your old things. Our haulers will be in clean uniforms and arrive on time as well. Professionalism is highly important to us, so you can count on us to be there when we say we will. Here at 1-800-GOT-JUNK?, there is no job that is too big or too small for us to handle. We have nearly 30 years of experience in this business, so it is more than likely that we have handled a job similar to yours in the past. No matter what you need to get rid of, just point and junk disappears! You can count on our junk haulers to get rid of your unwanted things as quickly as possible. If you're not watching, you might not even notice that we have already been and gone, leaving no junk behind. If you have any questions about our services, we are always more than happy to help. Our friendly associates will answer your questions and walk you through the details of our services and pricing structure. We want you to have everything you need to make a fully informed decision about working with us. So don't let heaps of old junk ruin the atmosphere in your Brisbane home or office. Call 1-800-GOT-JUNK? today to have it hauled away. You'll love the feeling of having a clutter-free environment so that you can focus on the more important things in your life. Uni Students Work With Rubbish! Uni students just love working for 1800-GOT-JUNK?. Why? Because we offer a fun, healthy and variety-filled work environment that provides the flexibility of hours to suit their schedules. We regularly receive applications from uni students wanting to work for 1800-GOT-JUNK? and we make sure that we only employ the absolute "cream of the crop!" Pictured here are two of our latest top recruits. James is studying for a Bachelor of Regional and Town Planning and Eduardo is studying for an MBA in International Hotel Management to add to his MBA in Marketing. Make sure you give them a wave if you see them in the main streets around Brisbane doing one of our famous "Blue Wig Waves" to cheer up the rush hour commuters.